Psychotherapy is one of the most common treatments for Major Depressive Disorder (MDD) together with antidepressants. It is the best option for mild to moderate depression, or combines with medication to treat severe depression, and is the most successful way to prevent relapse of the disorder. Psychotherapy employs psychological therapeutic techniques to eliminate the depressive symptoms and behaviors of patients. Cognitive behavioral therapy (CBT) is the main and most effective type of psychotherapy to treat depression, which helps clients to address negative thoughts and problems, learn to positively interpret the environment and change their behaviors. Studies have shown that the psychological and behavioral changes after CBT are associated with neurobiological changes in the prefrontal-limbic pathway, such as decreased metabolic activities in the oribitofrontal cortex and the medial prefrontal cortex. More recent findings indicated a consistent result of neurological changes after CBT, and it is shown to be a normalization of brain activity, particularly when the brain is processing negative emotional stimuli. In addition to CBT, other studies also found some structural changes as well as increases of serotonin binding sites in the cortical region after other forms of psychotherapy, such as the psychodynamic therapy. Psychotherapy is designed to help depressed patients to understand and restructure their emotions, thoughts and behaviors, and more importantly, to improve coping strategies and problem solving skills . The prefrontal-limbic regions are responsible for these functions, therefore, the structural and functional changes in these particular brain regions, induced by psychotherapy, explained the effectiveness of psychotherapy. More future findings in neurobiological changes after psychotherapy will enhance the understanding of how psychotherapy works biologically and benefit in designing a more effective psychotherapy to target specific brain areas. Cognitive behavioral therapy (CBT) is commonly used to treat major depressive disorder. CBT is effective for patients with mild to moderate depression, and many researches found that CBT is effective alone without medication for some people. In general, CBT is short-term and requires about 10 to 20 sessions. Basically, CBT is performed by practicing therapists, who aim to help the patients to recognize their dysfunctional thoughts, understand the pattern of behaviors, and restructure the faulty belief and thinking— a cognitive change; and also, leading to a positive emotional and behavioral change. In short, the key principles of CBT are: thoughts, emotions and behaviors, which are interrelated. Particularly for depression, the therapist and the patient work together to identify current situations that lead to depression. The therapist will then help the patient to learn to perceive the situations adaptively and positively, and with practices, the patient will be able to change behaviors accordingly and eliminate depressive symptoms. CBT is also an effective psychotherapeutic approach for many psychological disorders, including panic disorder, obsessive-compulsive disorder, phobia, and post-traumatic stress disorder. In reference to the cognitive model, depressed individuals commonly have dysfunctional thoughts that affect their emotions and bahaviors. Depressed individuals tend to evaluate their situations with an automatic thought that is inaccurate and leads to a negative emotional state. After they learn to interpret their thinking in a more realistic and positive way, depressiveness will be improved. CBT is powerful at inducing long-lasting improvement because therapist also targets the deeper level of cognition. The basic belief about the self, the world and other people of the patient that possibly leads to depression would be modified. For example, recognizing that you have a lot of strengths other than weaknesses, and seeing more positive sides of your experiences. This is useful to help patients to deal with everyday situation in long term. To investigate the effectiveness of CBT on depression, some studies aimed to examine the biological principles underlying CBT. Interestingly, many studies showed that CBT leads to a normalization of brain activity, including a change in the prefrontal-limbic pathway in the patients’ brain after CBT compared to before or those did not participate in CBT. Neuroimaging studies showed that specific neural systems are relevant to MDD. 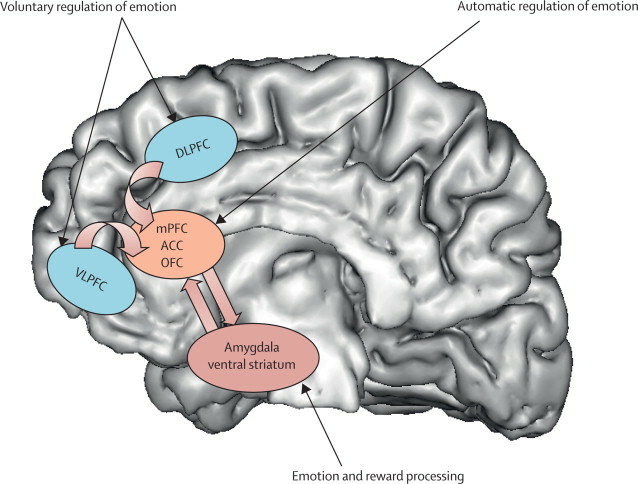 These include 1) amygdala and ventral striatum involved in emotion and reward processing; 2) medial prefrontal cortex (mPFC), anterior cingulate cortex (ACC) and oribitofrontal cortex (OFC) that are responsible for automatic regulation of emotion; 3) lateral prefrontal cortex, including dorsolateral prefrontal cortex (DLPFC) and ventrolateral prefrontal cortex (VLPFC), involved in voluntary regulation of emotion and cognitive control. The neurotransmitters implicated in this emotion and reward processing pathway are serotonin (in amydgala, ACC and MPFC) and dopamine (ventral striatum, OFC and MPFC). MDD patients showed abnormalities of brain activities in these regions, for instance, over-activity in amydgala, ventral striatal, and medial prefrontal cortex when processing negative stimuli. One study by Goldapple et al. (2004) found that CBT responders showed decreased activity in the prefrontal cortical regions. Research subjects, without any history of taking antidepressants, of this study completed 15 to 20 sessions of CBT. After the completion of CBT, significant metabolic changes associated with improvement in depression were showed in the treatment group (via PET scan), including decreased activities in the DLPFC, the VLPFC and the medial frontal cortex and increased activities in hippocampus and dorsal cingulate. A more recent study by Yoshimura et al. (2013) also indicated a normalization of brain activity in depressed patients who completed CBT. The study particularly examined the change in response to self-referential emotional stimuli processing. Depressed individuals commonly showed a negative bias during self-referential processing and evaluation of emotional stimuli, involving the brain regions such as the MPFC, the amygdala, and the ACC, as a cognitive feature of the disorder. Depressed patients, who had taken antidepressant but showed no improvement of symptoms, completed an at least 12-week CBT and were compared to healthy individuals3. Neuroimaging results (fMRI) showed normalized brain activities in depressed individuals after CBT, including decreased activities in the MPFC and ACC during processing of negative emotional stimuli, for example, when asked whether a word trait describes them negatively. In contrast, there was an increased activity in these regions when processing positive stimuli. These neurological changes are associated with improvement in depressive symptoms, including reducing bias to negative stimuli during emotion processing. In short, CBT seems to successfully target specific regions that appeared to show abnormal activities in depressive states. In addition to CBT, there are other forms of psychotherapy to treat MDD, for instance, psychodynamic therapy. Psychodynamic therapy employs some of the ideas of other forms of psychotherapy, such as the CBT, but it rather aims to reveal the unconscious side of the patients. Psychodynamic therapy assumes the patients’ behaviors are influenced by their unconscious mind and experiences, through exploring their unconscious emotions and thinking that may lead to depression, it helps them to re-gain a self-awareness and better understanding of their actions, and to avoid negative emotions. Many researches found positive outcomes of psychodynamic therapy associated with neurological changes. Patients with MDD, who completed short-term psychodynamic therapy in a study by Karlsson et al. (2010), showed an increased density of serotonin 5-HT1A receptors in cortical regions, including DLPFC, VLPFC, ventral ACC, as well as insular cortex, angular gyrus and the inferior temporal gyrus. This change in neurotransmission is unique to psychotherapy. Although antidepressants, such as SSRIs, also lead to improvement in depressive symptoms, they do not increase the serotonin 5-HT1A binding sites. The increase of serotonin 5-HT1A binding sites after psychotherapy highlighted the features of psychotherapy: emotional learning, as it indicates an improved regulation of emotion and possibly reduced stress. This top-down effect on modulating the serotonin system following psychodynamic therapy reflects the unique effectiveness of psychotherapy for MDD. In addition, Buchheim et al. (2012) examined the effect of long-termed psychodynamic therapy. Studied depressed individuals received psychodynamic therapy for 15 months. Neuroimaging had shown an aberrant hyperactivity in the ventral ACC and the MPFC before treatment, and similar to the effect of CBT, there was a decrease of activity in these regions after 15 months of treatment. These neurological changes in ventral ACC and MPFC are associated with improvement in depressive symptoms as indicated by the enhancement in both the Beck Depression Inventory (BDI) and the Global Severity Index (GSI), which measure the depression severity. Consistent with the studies on CBT, these changes following psychodynamic therapy involved in improving emotion control and regulation. Psychotherapy is strongly effective at treating MDD, whether alone or in combination with pharmacotherapy. Evidently, according to the neuroimaging studies, there are specific brain regions or neural network that only psychotherapy could target (eg. increase serotonin 5-HT1A receptors),,,. Overall, CBT and psychodynamic therapy as well as other forms of psychotherapies, such as interpersonal therpy (IPT) and Behavioral Activation Treatment for Depression (BATD), could lead a normalization of aberrant brain activities associated with improvement of depressiveness. This top-down modulation of neural system after psychotherapy included reduction of activation in OFC, DLPFC, VLPFC, MFC and ACC, and increase of serotonin binding sites,,,. 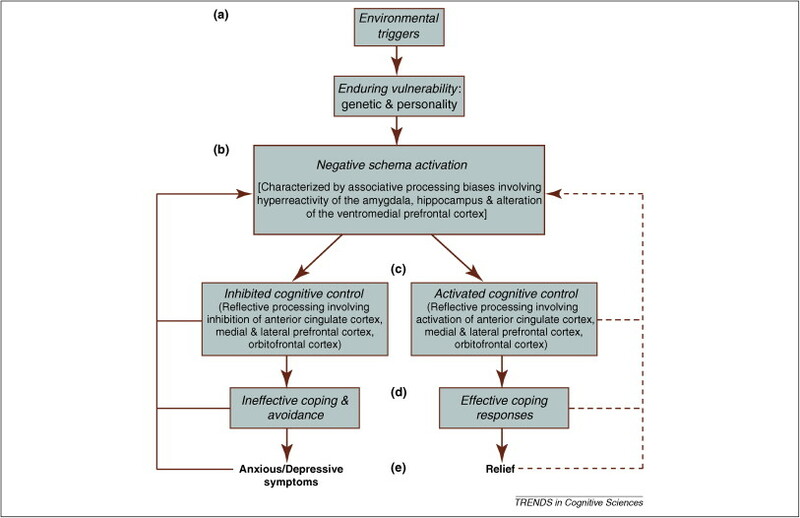 Since psychotherapy aimed to improve patients’ cognitive function, regulation and processing of emotion and reward, changes in these neural regions reflect a successful control and coping of dysfunctional emotions and behaviors. The use of the psychotherapy can also be an effective option for those who do not respond well to antidepressants, and also for children and adolescents to lower the risk of suicidal effect, since there has not been any significant long-term adverse effect of psychotherapy reported. In general, many researches only focus on the psychological aspects of psychotherapy and neglect the biological perspectives that underlie psychotherapy. Understanding the influence of psychotherapy on the human brain will benefit the future development of psychotherapy for MDD, and also other psychological disorders. Those neuroimaging studies provided a good preliminary base for researchers to investigate and refine the understanding of how psychotherapies work biologically and psychologically. In the future, psychotherapy may develop to be even more effective by targeting specific brain regions for specific disorders. 1. Depression. National Institution of Mental Health (NIMH). (2011). Available from http://www.nimh.nih.gov/health/publications/depression/depression-booklet.pdf. 12. Karlsson, H. How psychotherapy changes the brain. Psychiatric Times. (2011). 28(8), 21-23.
hi, I'm linking your wiki to mine. Hope you dont mind! There are other psychotherapies that you didn't mention like existential, experiment dynamic psychotherapies. Also a section maybe into the development and history of psychotherapies would have been really interesting. Great break down on CBT though! well done!